Qatar Airways flies from the UK to Doha 72 times a week from its London Heathrow, Manchester, Edinburgh and Birmingham gateways, with onward connections to more than 150 international destinations across Africa, Central Asia, Europe, Far East, South Asia, Middle East, America and Oceania from its base at Hamad International Airport with a mixed fleet of Airbus and Boeing aircraft. 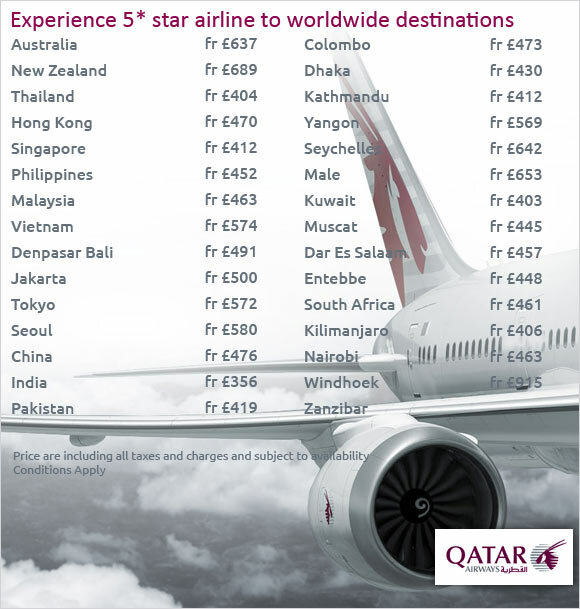 Join Qatar Airways onboard one of the world’s youngest fleets, and discover what an award-winning airline with an ever-expanding global network has to offer. Make your flying experience impeccable with one of the widest and most spacious seats available in the sky and cabin crew that been voted “Best in the Middle East”. Seat pitch of 32 inches with adjustable headrests for comfort and flexibility. Experience the world’s most memorable destinations with an unforgettable journey in the World’s Best Business Class, as recognised by 2016 Skytrax World Airline Awards. You can find yourself at ease in well-designed and sophisticated cabin where the seats are designed to provide you more space to stretch out. Grab the ultra-relaxing seat loaded with technology and features. 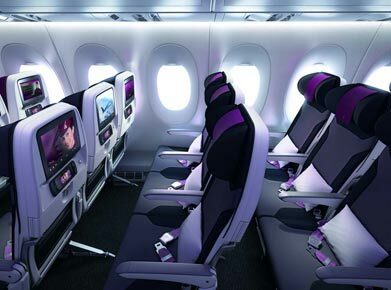 Lie-down on fully flat beds while aboard to relax during the course of your flight. Experience a classy Business Class that is specialized to serve all your comfort needs from cotton-lined pure wool blankets and 100% cotton sleeper suits. Get pleasure from the brilliant in-seat service geared to satisfy your body clock the instant you’re greeted with welcome drink and hot or cold refreshing cotton towels. 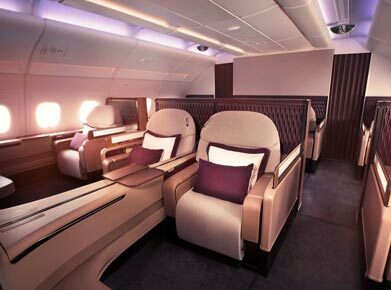 Qatar Airways pours the privilege on you to choose to dine, breakfast, or relish a light snack. Plush comfort and refined dining await your arrival at the award-winning Premium Terminal. You can get your hands on the state-of-the-art business facilities, secretarial services and complimentary Wi-Fi to cater to all your business needs. Baggage allowance of 30 KGs. 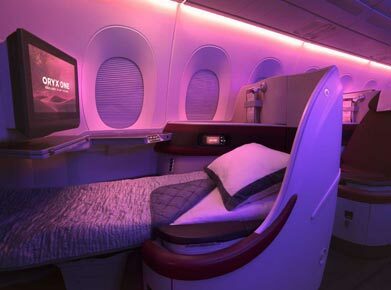 Qatar Airways First Class cabin is designed to provide maximum space and exceptional comfort with elegant style and crafted luxury. Indulge in signature dishes developed by world-renowned chefs.